The Hamzanama, or 'Book of Hamza' was commissioned by the great Mughal emperor Akbar in the mid-16th century. The epic story of a character based very loosely on the life of the uncle of the Prophet Muhammad chronicles the fantastic adventures of Hamza as he and his band of heroes fight against the enemies of Islam. The stories, from a long-established oral tradition, were written down in Persian, the language of the court, in multiple volumes but no independent contemporary text is now known. These originally had 1400 illustrations, of which fewer than 200 survive today. Work probably began in about 1562 and took 15 years to complete. 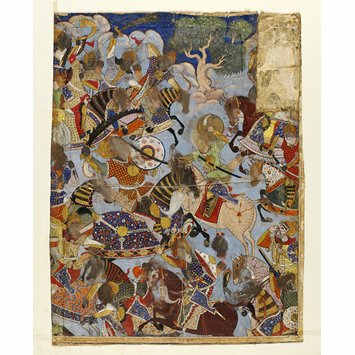 This very damaged scene is said to depict Hamza's army fighting Girang's men and killing a giant. Two protagonists occupy the centre of the composition, battling against each other on horseback. Their followers are on horseback, the outlines of their animals cut across by the frame of the composition and truncating them. In the background, a tree rises from the rocks. A damaged panel has been replaced with blank cotton at top right. The painting is very creased and the surface is poorly preserved, with faces damaged and some features repainted. 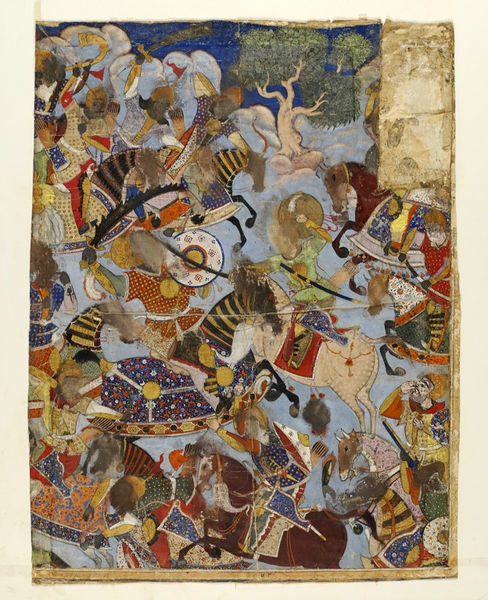 An illustration to the epic romance of the Hamzanama commissioned by the Mughal emperor Akbar. bought for the museum by Caspar Purdon Clarke in Srinagar in 1881. The 'Hamzanama' was the first major project undertaken by the new painting studio of the Mughal court. Directed by two Iranian masters brought to India by Humayun, work began under Akbar and was said to have taken fifteen years to complete, drawing from artists from all over northern Hindustan. Hamza's army battles Girang's men and kills a giant. Hamzanama. ca. 1562-77. Seyller, John. The Adventures of Hamza. Smithsonian Institution. 2002, cat. R158, pp. 276-277..